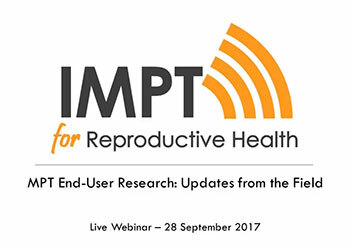 This live webinar highlighted new research exploring the acceptability of and preference between potential MPT product types, drivers of future product use, and other important end-user considerations. It featured presentations from Moushira El-Sahn and Jeff Lucas (Routes-2-Results), Barbara Friedland (Population Council), and Alexandra Minnis (RTI International). El-Sahn, M., Lucas, J., Friedland, B., Minnis, A.